Shortly put, Shadwen is an explosive stealth game where the only rule is to remain unseen at all times. If you get caught, it’s game over. Luckily, there are a bunch of gameplay mechanics that make this a lot of fun. For starters, time only moves when you’re moving, so you have ample time to plan your moves, even in mid-air. Second, should you make a mistake or wish to try some maneuver (a kill for example) in a different way, you can instantly rewind time and try again! The premise of the story is that Shadwen, an assassin on her way to kill the king, has a chance encounter with an orphan girl, Lily. The girl has been caught stealing and Shadwen decides to help her out of the precarious situation. Throughout the game you have the option to play either lethally or non-lethally, starting from the first encounter. The story will be different depending on your choice to kill or not to kill. You will, however, need to take action one way or the other! Physics and the movement of your character play a big role in the game. 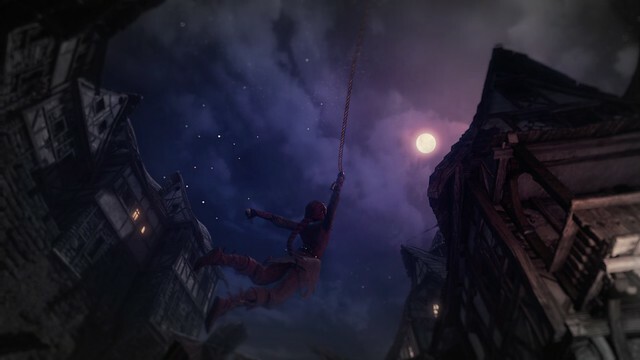 You’re free to traverse the medieval city with your grappling hook and impressive acrobatic skills. You can topple over crates and barrels from high up to surprise unsuspecting guards or plant bombs and other deadly devices onto various objects to watch your opponents die in gruesome ways. There’s a lot of room for experimentation and pretty much anything can work! You could, for example, load a cart with poison dart traps and push it downhill onto a group of guards. If it doesn’t quite work out as you first pictured it in your mind, you can instantly rewind time and try something different. Perhaps exploding bombs would have been the deadlier choice, or distraction the stealthier option?